I have stayed in various locations on the island such as Binibecca, Mahon (the main ‘city’) and S’algar. I love all of the locations but they all offer different experiences. Binibeca is great for families and young children. There are villas to rent, beaches with water sports and child-friendly restaurants. I would highly recommend Binibeca for families with young children or teenagers. Mahon is great for young people, couples or teenagers. It’s a small city with a good nightlife, fancy restaurants and popular bars. Maybe not great for a three week beach holiday or young children! S’algar is a great coast side town with its own 5* dive centre, resort, turquoise water beaches and a gorgeous walking route in which you can walk to Punta Prima or Binibeca. There are a few restaurants and bars within walking distance in S’algar too as well as a wide choice of apartments available to rent either from Port blue resorts, Air B’n’B or Homeaway. Pan Y Vino: Pan Y Vino is a very lovely restaurant that serves both beautifully looking and tasting food and the most romantic and homely setting. You sit on a brick patio undercover. The staff are ever so friendly and the food is reasonably priced in regards to how luxurious the whole experience and your treatment is. The food is a mix between French and Spanish as the owners are both French and Spanish. Hotel Rural: Has the quaintest setting with heart shaped chairs, floral patchwork cushions and tropical plants. This is somewhere to go for some delicious food, a cute homey environment whilst still being outside amongst the tropical weather and plants. This is, in my opinion, the perfect setting for a very special date night. The food is once again affordable whilst still being full of flavours and well presented and the staff were very welcoming and friendly. Way, Mahon: Resturant way is a delicious Chinese/Thai/Japanese restaurant that serves anything from noodles to fresh sushi. They do a set lunch menu which costs only ten euros for three courses. I really enjoyed how beautifully the food was displayed and how full of flavours and spice the food was. The staff were very friendly and accommodating. Binifadet: This restaurant was just stunning set around a vineyard with a roof of vines. The food was delicious and not too expensive whilst the wine was hard to stop drinking and again affordable. The vineyard is open for a wander after lunch which I and my parents enjoyed as we were full from all of the delicious food and well in need of a walk. There is a gift shop in which you can buy anything from candles and face oils to wine and tote bags. 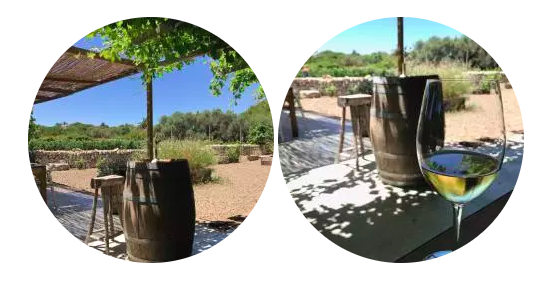 The restaurant also offers wine tours twice a day where they show you the process of wine making from picking the grapes to squashing them into delicious wine. Bringing it back again to Binifadet, this a lovely place to come even if you just want to enjoy a few glasses of wine. They have a bar/cafe towards the front of the restaurant where you can just sit under the fairy lights and enjoy anything from a coffee to cocktails! Binibecca: This is a great beach for young children and families to enjoy as there is a range of water sports such as Kayaking, paddle boarding and boating. There is also a beach bar which is great for lunch, ice creams or a bottle of wine. Cala d’alcaufar: This is a lovely small and local beach with a beach restaurant that serves delicious wine and black rice. This beach is sheltered from rough seas or jellyfish but be careful swimming out to see as it is a little rocky. If you don’t like busy beaches then this is the perfect beach for you! As far as I’m aware this is the smallest beach on Menorca and it is unnamed but it’s located a small walk from Cala d’alcaufar. The very small beach offers enticing turquoise waters and small caverns. This beach is great for a quick dip or some snorkelling. Caribean or Menorca? Nobody Knows?? Punta Prima: This is a slightly over commercialised beach but it’s beautiful all the same. Punta Prima is a great place for families to visit and stay with turquoise waters and golden sandy beaches. This is a nice big beach with sunbeds and umbrellas available to rent. In terms of shopping definitely, check out the main city called Mahon. They have lots of cute and quaint shops such as shoe shops, swimwear shops, bath shops, a gin shop and a Mango! I really hope you guys enjoyed this blog post. If you’re looking for a new and affordable holiday destination then I would highly recommend that you look into visiting Menorca. See you guys next Sunday at 6 pm for a new blog post!